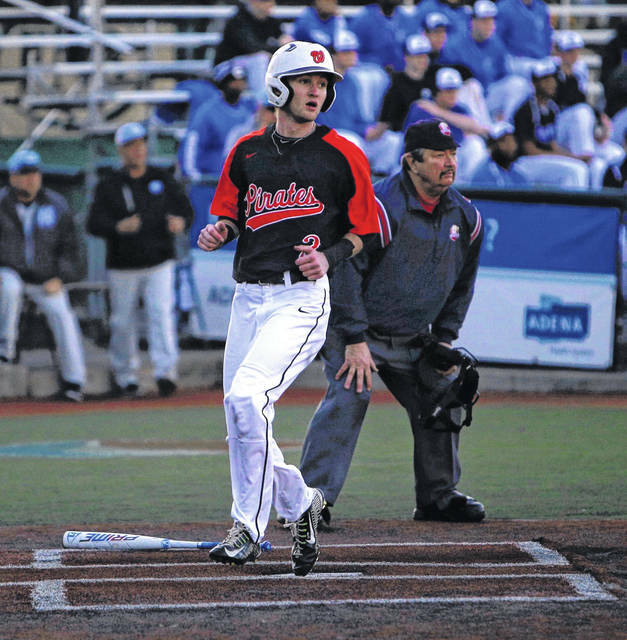 Wheelersburg’s Connor Mullins crosses home plate Saturday afternoon at VA Memorial Stadium during the Pirates’ 6-5 loss to Hilliard Darby in both teams’ season opener. 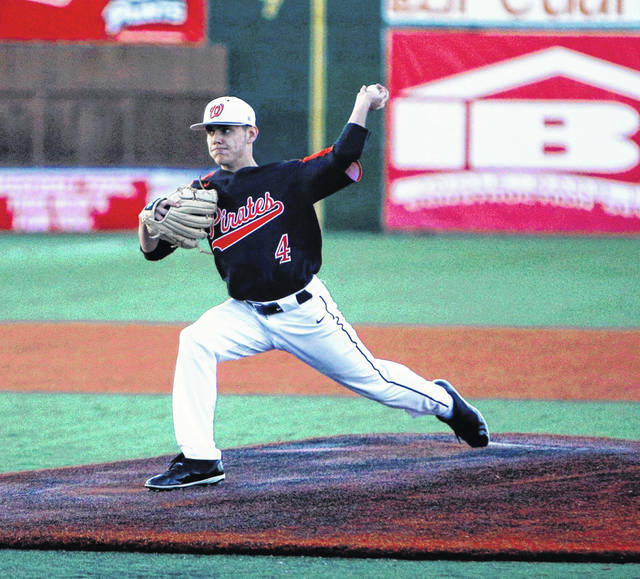 Wheelersburg senior Trey Carter throws a pitch during the Pirates’ season-opening 6-5 loss to Hilliard Darby, Saturday at VA Memorial Stadium. CHILLICOTHE — Wheelersburg’s Derek Moore will have to wait at least two more days before he gets his first head coaching win. But still, he was beaming with pride after his debut. Moore’s Pirates fell in their season opener Saturday afternoon at VA Memorial Stadium, dropping a 6-5 decision to Hilliard Darby in a game they once trailed 6-3 in. Heading into the fifth inning, Hilliard Darby (1-0) had built a 2-1 lead. But in the top of the frame, Trey Carter got the Pirates’ offense going with a one-out single. That gave way to back-to-back triples via Connor Mullins and Jalen Miller, putting the Pirates (0-1) ahead 3-2. Miller was 3-for-5 on the day, logging two triples and two RBIs. Moore wasn’t surprised. Mullins, who’s still fresh off the Pirates’ regional basketball run, also looked to be in midseason form. He finished 2-for-3 with a triple, two runs and an RBI. After Mullins and Miller gave Wheelersburg the lead, Darby took it back at 4-3 in the bottom half of the inning, chasing Pirates starter Trey Carter from the hill — who was replaced by Miller. In the sixth, the Panthers extended that lead to three runs at 6-3, thanks to two walks, two hits and a catcher’s interference call. Wheelersburg made one final push in the seventh, scoring two runs to produce the day’s final, but stranded runners on base when the last out was recorded. Carter took the pitching loss, throwing 4 ⅔ innings. But for the better part of the day, the senior showed significant promise while mowing down the Panthers’ lineup in impressive fashion. The Pirates get back to action Monday evening, traveling to Raceland (Ky.) for non-conference action. They’ll start SOC II play Wednesday at Northwest.